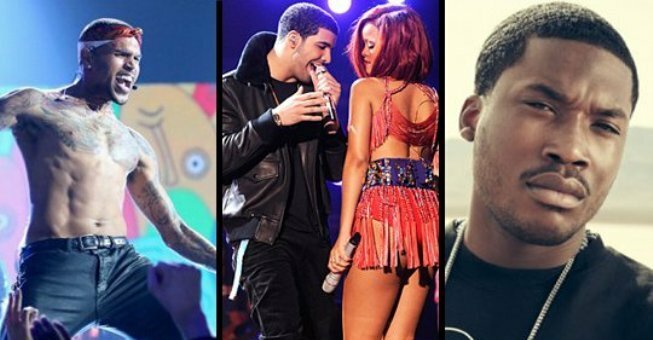 Rihanna is at the center of a heated beef between Chris Brown, Meek Mill and Drake. The beef all started when Rihanna was spotted partying with Meek Mill for his 25th birthday. The two reportedly had a fling afterwards. “You took me off your song cause she let me watch the throne #dreamsandnightmares,” Meek Mill tweeted. Chris Brown then sends out his own subliminal tweet. “She’s a dream chaser, There are a lot of dreamers so she’ll be running forever!” Breezy posted on Twitter. Rihanna chimed in the beef with her own thoughts on Twitter. “The best is that EYE get to choose,” RiRi tweeted. Sound off on the saga below? What she don’t know is that its choice is only a illusion, she is led to believe that the choice to sleep with these guys is hers, but in actuality she is being used. indeed only girl in the world. hehehehe boyz wil b boyz! sorry boys that a woman running your careers.